You can be a part of the programs you watch by becoming a member of MCTV. 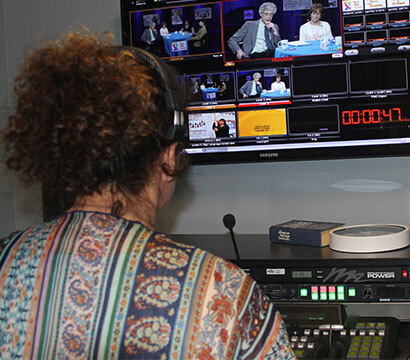 Our members can develop the necessary skills to produce their own local television programming. Members are also encouraged to network with other members in order to facilitate the production of more programming. There is no charge for membership, but it is renewable on an annual basis. Membership is only available to Methuen Residents 16 years of age or older. Children ages 13-16 can become junior members if their parents are supervising their participation. To become a member or renew your membership, you can fill out our membership form online. MCTV requires that members are certified on the equipment that they are using to create programming for Methuen Community Television. We offer a full curriculum in television production to our members. Training is free! Please feel free to call us at (978) 689-8627 to ask any questions and pre-register so that you can get YOUR program ideas up and running. Learn how to host and interview guests for a TV program. Please note: This orientation qualifies the member to HOST a show ONLY. Every show must have a PRODUCER who has completed the training listed below. It can be the HOST or ANOTHER MEMBER who has agreed to produce the show for the host. Appropriate school or job experience will be taken into consideration. Bring your ideas to life. The producer makes decisions about the show and is legally responsible for its content. Let us help! Learn the ins and outs of working in a professional, state of the art television studio from the ground up. Along with your fellow crew members, you will create quality programming to share with the Methuen community. Do you like to attend local lectures, concerts or awards banquets? Share them with the community! Learn how to videotape events effectively with a single HD camera. ALL TRAINING LISTED BELOW** IS ONLY OPEN TO MEMBERS WHO MEET THE PREREQUISITE REQUIREMENTS OR SHOW RELEVANT EXPERIENCE IN PRODUCTION. Learn how to direct the studio production. Please check back later for more dates and times. Take your studio production out in the community. Learn about setting up cameras, tripods, multiple microphones, and the DataVideo system. Non-linear editing (Final Cut Studio), graphics creation (Broadcast Pix/Motion) and additional training is available on an individual or small group basis. Appointments can also be scheduled individually with MCTV staff. To sign up for these training, please call the studio at 978-689-8627, send us an e-mail request or visit the studio in person at 20 Aegean Drive, Unit 11. All people taking training must qualify as members of Methuen Community Television and fill out the appropriate membership form.